On a stormy night during the summer of '07, I desperately needed an escape. Writer's block plagued my brain, and I couldn't brush away that "sludge" for the life of me. After struggling for hours, I decided that a trip to the movie theater might be exactly what I needed. Since it was late at night and I couldn't get in touch with anyone, I took it upon myself to catch a flick alone that I'd been dying to see, but lacked the opportunity to do so: Stardust. 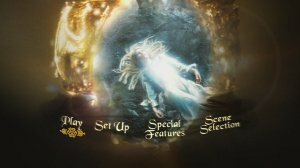 At first glance on the trailer, Stardust felt like it could be a cheap knock-off of the Lord of the Rings films as it sports a dizzying amount of computer-generated candy for the eyes in a colorful, yet dark, world. Add a dash or two of the recent epic adaptation of The Chronicles of Narnia in poise, and you've got what seemed to be a sub-par fantasy flick on its way to a cinematic nosedive. However, with a little wink from Michelle Pfeiffer and a gruff scowl from Robert DeNiro, I was still left with an itching desire to give this a chance. Nothing could prepare me for the radiance that began to sparkle when Stardust appeared on the screen. In short, Matthew Vaughn's film is pure, beaming magic in all the ways that other fantasy films dream to be. When a falling star drops from the sky, it usually means a thousand wishes are being uttered by lips and minds across many many miles. In this instance, this celestial firework is the start of a great quest to fetch its remains. With a flick of the wrist from the great King of Stormhold (Peter O'Toole), he flings his enchanted necklace towards the sky. Through his proclamation afterwards, he states that whoever of the remaining males in his bloodline reclaims the necklace shall hold inheritance of his throne. His seven sons, only four of which are still alive, are notorious for murder across their family in effort to secure their birthright. In the end, only one of these bloodthirsty Stormhold heirs can be victorious. 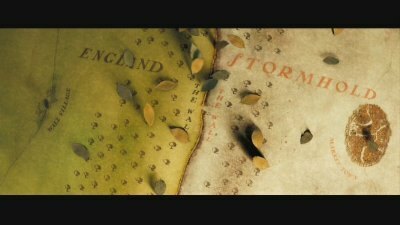 Stormhold isn't in the same world as knights and dragons, as far as we know, but more in the realm of swashbuckling and dark enchantments. It is a place where the barriers of possibility are shattered. Man and beast can be transformed as seen fit, pirate ships manned by the ambiguous Captain Shakespeare (Robert DeNiro) fly across the skyline and, most importantly to us, stars can be living, breathing entities. In ushers the enchanting fallen star Yvaine, handled beautifully by Claire Danes. 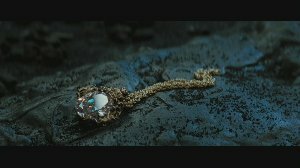 Not only has her peaceful existence been disturbed by the king's bidding, she now holds the necklace in her possession at a crash site somewhere on the Stormhold side of The Wall, the mystical partition between the realms of fantasy and reality. But her troubles don't cease here. In the evil eyes of witches, a fallen star means the potential to regain their youth. Led by the sinister Lamia (Michelle Pfeiffer), three cooped up hags plot a course to retrieve this fallen star for their own selfish means. Only once they consume the powers of this celestial being can their true potential flush their bodies once again. They're a motley crew, satisfactorily brought to screen by Pfeiffer and her cohorts. Through rune stones, animal innards, and some mystical conjuring, Lamia shall stop at nothing to claim her and her sisters' powers in full once again. But alas, in the innocent eyes of a smitten eighteen year old boy named Tristan, this celestial firework is nothing more than his only chance at the pristine love of his life. 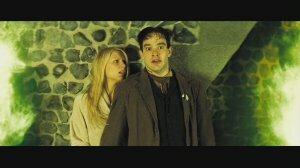 Played deftly by Charlie Cox in his first major role, Tristan must hurry to cross The Wall over to the enchanted realm of Stormhold to fetch this radiant prize for his love, Victoria (Sienna Miller). If he doesn't return within one week's time, she'll give her heart to another man. Tristan, willing to tumble across the face of the earth with dirt in his face from his fair maiden's shoes, sets out on his destined course. But what Tristan doesn't realize is the fact that he is completing a family custom, the same as his father did when he crossed the wall and met an alluring, mystical woman ... eighteen years ago. Stardust, whimsical and joyful as it is, is the quintessential fairytale. It's a tale leaped straight off the pages of a storybook that envelops us completely from head to toe in its radiance. More importantly, this is a wonderful film without agenda or message, unless you count the generic "follow your heart" undertones in all these types of stories. Matthew Vaughn, director of the solid independent crime thriller Layer Cake, brings us a funny and delightful film that sets out on one mission alone; to enchant those who embrace it. And boy, does it enchant. The concept of a fallen star existing as a living, breathing entity is the cornerstone of Stardust's charming heart. There's something mystical about the entire thing, something that slaps a grin on your face at the prospect of a world that has millions of pincushion stars peering down observantly. At least, there was a grin on my face from minute one until the end. I love this movie, even more the third time through than I did that first faithful night. Maybe it comes from stellar casting and performances across the board, or maybe it's the wonderfully heartfelt escapism that surrounds Stardust. No matter which, it's easily one of my favorite pieces of cinema from 2007, probably because it surprised me with just how astonishingly warm it is. Now, that doesn't mean Stardust is a flawless film. A few spots slink by without explanation that leave a hint of lingering doubt about their undertakings. Certain non-magic wielding individuals spark hair to grow and capture lightning in a bottle, and we're supposed to just believe in this. The same goes for later on when a few other magical little curiosities pop up here and there. Now, the romance behind a necklace floating to the sky and knocking a star to the earth is embraceable, but it's difficult to completely surrender magical happenings over to a belief that other points just "happen". However, if any story holds enough charm to lure us to surrender to its imagination, it's Stardust. It succeeds in sponging in our concentration and gleeful exuberance to a point of yielding belief - almost all of the time. But who cares about that, really. Where Stardust faults in minute continuity contrivances, it more than conquers these bumps with its fancifully brilliant charm and engrossing cosmos. It nails down charisma from top to bottom as it sweeps us into this rich, unbelievably lurid environment without any intent of letting us go. 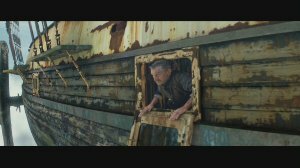 Vaughn's cinematographer, Ben Davis, captures an astonishing amount of beauty within both the environment and within the glorious prop and set design. Paired with an exquisite score, this picture is actually quite vivid. Each and every frame reminds me of a wonderful daydream trapped inside a starry-eyed child's mind. It might be a little naughtier in spats for a youngster, but there's this inspirational manner bubbling within Vaughn's film for both young and old to enjoy. That, as well as its capacity to make you smile until your cheeks ache, makes Stardust a slice of cinematic wonder well worth seeing. I'm certainly glad I did, and will be glad every time afterwards. Paramount has assembled a standard keepcase packaging for Stardust, featuring some relatively attractive "floating head" coverart. As per Paramount's typical DVD packages of recent time, no chapter listing is included and the disc has a matted, silver finish with the film's title engraved upon it. Paramount's 2.35:1 anamorphic widescreen image is a solid effort, but lacks consistency with its beauty. Stardust is a visual stunner of a film, boasting a chaotically gorgeous blend of bright beauty and stunningly deep hues. The scenery captured really gives the film a grandiose feel as you shift from location to location. First and foremost, we are working with a spotless print. Never did any detracting specs or flaws pop up. Contrast levels, especially during daytime scenes, appeared quite stable and well balanced. Claire Danes' white "starry" glow looked exquisite, as did most of the other digital effects across the film. Most everything captured during brighter portions of Stardust looked terrific. However, the transfer isn't without a few problems. This presentation of Stardust has troubles with darker scenes. Digital noise is fairly apparent within most nighttime shots, rendering a bit of a muddy look at times. As is the case with several facial features, a lot of the contours and lines from slightly distanced shots grow a little mucky. Also, the ridiculously lurid palette in the film suffers a bit from looking a little muted in saturation. I remember the film being a bit brighter with its color scheme in the theater, and it just doesn't look quite as vivid here. Even these noticeable points are touch and go, though; in other instances, like a subsequent reverse shot in a darkened attic, the digital solidity looks fine. Furthermore, there are more than a handful of scenes where the color depth looks incredibly striking. Instead of being a sweeping achievement across the board, Paramount's Stardust presentation instead settles on looking phenomenal only a good majority of the time. Stardust's Dolby Digital 5.1 track packs a whole lot of solidity, period. It's a great sounding film with a terrific score and sound design. Paramount made certain to preserve all these elements quite well in an expansive, tightly wound aural treatment. Vocal strength is paramount here, as every word that escapes the actor's lips pour through with tremendous crispness. Also, there's a particular scene with large panes of shattering glass that really pushes the envelope with some screaming high pitches. Flushing water and billowing fire also shoot out in several directions from the center. All the sound effects come loaded with plenty of punch, especially the lower bass levels. Instead of billowing with large punches when horses gallop or carts crash, this audio treatment thumps with an impressively tight gravity. The only gripe I have is that, in a few instances, dialogue and some sound effects seem It's not the loudest, most impressively engulfing aural treatment I've heard, but Stardust sounds excellent. Subtitles are available in English, French, and Spanish, as are French and Spanish 5.1 Dolby tracks. At first glance, you'd think this DVD didn't contain any solid bonus footage of the film being crafted. 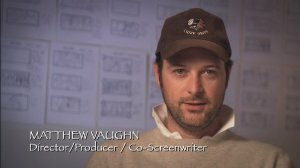 However, with its meager 30 minutes of time with us, Good Omens actually takes us on a well-designed, pretty in-depth trip within Vaughn's filmmaking process. We're treated to plenty of green screen work, CG screen comparisons, as well as commentary from the actors and actresses from the film while paired with rehersal footage. Furthermore, we get to hear a bit from Neil Gaiman about the assembly of his story and its story-to screen transition. Could the elements addressed in this piece be elaborated on further? Absolutely, but for 30 minutes this making-of featurette serves up enough interesting tidbits to be worthy of our time. Stardust is paced wonderfully in its final presentation, and these deleted scenes show us why. Each and every one of the cut portions feels unaligned with the film, either as a contradiction to tone or as worthless inclusions. There are two different kinds of deleted scenes: the ones worth seeing because of their quality, and those worth seeing because of how they would've altered the film in a negative light. These scenes fit in the latter. Honestly, I laughed harder at this blooper reel than I have at most reels I've seen on other DVDs. We get to see our hero Tristan fumble repeatedly, as well as hear random bleeped explicatives from all parties involved. Finally, an awesome anamorphic Trailer is included, perfect for watching right before the film. It'll show you how the movie is portrayed through its initial outreach, then you can see how it differs from the film itself. Also, a link that replays the initial Previews at the start of the disc is available. Here's hoping that Stardust will find a much larger audience on DVD than it did at the theaters, because it is an excellent fantasy film packed solid with rich performances and a reliably stimulating narrative. Similarities between it and The Princess Bride are inevitable; Stardust is not nearly as quotable, but it's equally as entertaining and amiable - if not more so. Though that'll depend on the viewer, Stardust feeds off of a similarly enjoyable vein. Paramount's standard disc comes with a solid audio and video presentation, but only a few quality extras. More elaboration on its supplemental content, and a small boost in visual strength, would elevate this title to higher ranks. However, based on the overall cinematic, tangible, and contextual prowess in this disc, Paramount's Stardust DVD comes Highly Recommended.